Mange is often misunderstood and misdiagnosed by the average pet owner. Not every itching condition is mange, and not all mange itches. Mange comes in two common types, each of which requires different types of precautions and treatment. Demodex is also known as red mange, follicular mange, or puppy mange because it is often seen in younger dogs. First symptoms usually appear as small, hairless patches around the eyes or on the muzzle. Demodectic mange isn't usually "itchy" and is not contagious. It is caused by the presence of a tiny, eight-legged mite that lives in the hair follicles, and, surprisingly, lives uneventfully on almost every adult dog and many other animals - including humans - with no signs or symptoms. Almost all puppies actually pick up the demodex canis mite from their mothers during the nursing period. Diagnosis usually requires a microscopic examination of a skin scraping to actually view the mite. Symptomatic response to the presence of the mite (mange) usually occurs only in younger dogs with poorly developed immune systems or older dogs with depressed immune systems. Young dogs who "outgrow" the mange as their immune systems develop sometimes have symptoms recur during times of stress such as when females come into season or are pregnant. Dogs who become symptomatic are giving you an idication of an inadequate immune response. For this reason, it is a good idea to monitor any other conditions which might be affected by a weakened immune system. Improved diet, multi-vitamin supplement, and added fatty acid supplements are sometimes indicated. While demodectic mange is not hereditary, the inability to tolerate the presence of the mite without symptoms is a different matter. There is some evidence that breeding stock which has shown sensitivity to the mite can pass that sensitivity on to their offspring, making the selection of breeding stock particularly important. Dogs who show symptoms or have parents or siblings who have a history of red mange should probably not be bred. Localized demodex lesions or minor cases can sometimes be treated by using a rotenone ointment. However, generalized demodex treatment entails treating the affected areas (or often the whole animal) with an insecticidal dip - particularly a dip containing Amitraz such as Mitaban. It is often difficult to really get rid of the problem and can take from 4 to more than 10 dips. Additionally, some small or toy breeds cannot tolerate full strength application of the products. Secondary bacterial infections of affected areas may also accompany the condition, so antibiotics are often indicated. According an article published by the Cornell College of Veterinary Medicine in their Newsletter Dog Watch, "Newer treatments involve using cattle formulation of ivermectin or milbemycin (Interceptor), a heartworm preventative usually given once monthly. * Though not approved specifically for this use, these oral treatments are prescribed by many veterinarians for demodicosis (mange caused by the Demodex mite) because they're very effective and much easier to administer. * Do not treat Collies, Shetland Sheepdogs, Australian Shepherds and some other herding dogs with Ivermectin. Scabies is a skin condition caused by a tiny mite burrowing just beneath the surface of the skin. 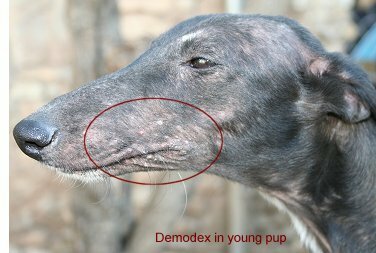 Unlike demodex, sarcoptic mange is highly contagious and affects other dogs and humans, causing intense itching, sores, and hair loss. Red pustules and yellow crusty sores appear over the dog's body and may be particularly prominent early-on on the ear tips. Intense itching leads to continued scratching, causing open lesions which invite secondary infections. Sarcoptic mange is often misdiagnosed as an allergy. Definitive diagnosis is often difficult to make, as it requires a skin scraping and microscopic examination which is only about 20% effective in discovering the mite. Treatment has traditionally involved multiple insecticidal dips. However, more recently, ivermectin, Interceptor, and Revolution have been used with success *. Because of the extreme contagious nature of scabies, it is also important to treat all of the dogs in the household (even if they aren't scratching) and launder and/or spray your pet's bedding. The mites can transfer to humans and cause itching and redness. They rarely complete their life cycle on humans and usually die off in just a few days if re-infestation doesn't occur.